While many people feel timid about using pressure cookers, the truth is that modern pressure cookers are incredibly safe and virtually goof-proof. You don’t need to have any worries about the pressure release and gasket quality—today’s designs have several valve safety systems to keep you safe in the kitchen while enjoying the benefits of deliciously fast cooking. Pressure cookers are so versatile and can do the job of other techniques from; Dutch oven, steamer, to saucepan—it’s a complete multipurpose pot. Best of all, pressure cooking is fast and healthy. It gives you the ability to cook 70% faster and with less energy. Preparing recipes like a hearty beef stew would normally take hours, but you can achieve it in 30 minutes or less when using a pressure cooker. Even better, pressure cookers contain all the cooking mess inside, leaving behind no oily and saucy splatters on your stove-top. 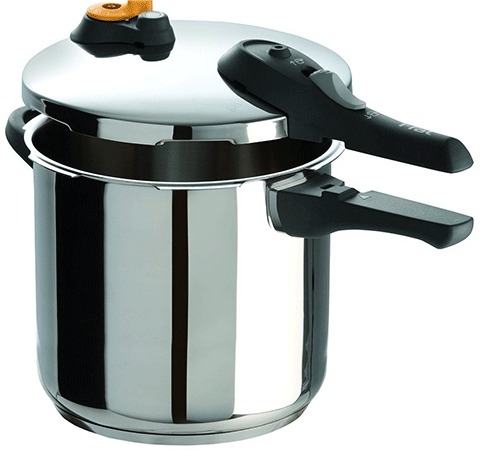 The T-fal Stainless Steel Pressure Cooker model P25144 features a quality built stainless steel body with riveted handles for a good grip. Suitable for a variety of heat sources—induction safe. The lid is easy to secure and lock and also features a steam release valve control for even more precaution. The lid will not be able to open when contents are under pressure. Side handles for easy holding. Large design allows for larger meals. Exterior allows you to cook on almost any surface including induction. Plastic components wear easily and can prematurely break. Size makes it a bit cumbersome to store. Prone to having food stick to base of pan. 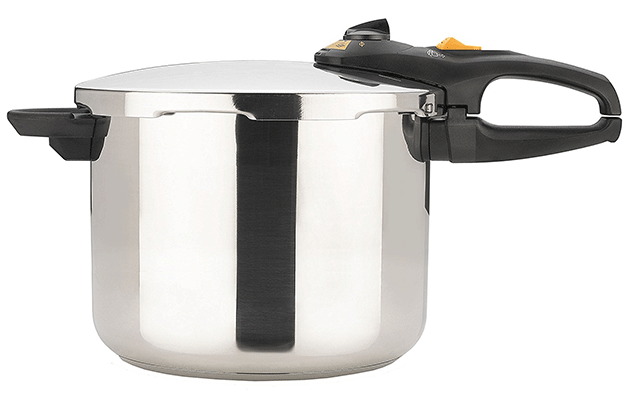 The Kuhn Rikon Stainless Steel Pressure Cooker is made from 18/10 stainless steel with a solid aluminum core in the base, allowing it to heat quickly and built to maintain the same performance use after use. This pressure cooker is incredibly quiet—no hissing. When cooking is finished, simply turn the knob to release. It has a spring-loaded precision valve and an integrated locking lid with five safety releases so you can cook with confidence. The Kuhn Rikon is made in Switzerland and comes with a 10-year warranty. They offer pressure cookers ranging from 3 to 12 quarts and include the traditional style as well as stockpots and fry pan pressure cookers. All cookers are dishwasher safe. High quality Swiss design with 10 year warranty. Spring-loaded precision valve built into integrated locking lid with five safety releases. Can be used on any cooktop including induction burners. Slightly below average size at 5 quarts. Expensive compared to similarly designed pressure cookers. Not as durable with addition of aluminum layer sandwiching steel. Granite Ware Pressure Cookers feature one of the largest capacities—able to hold up to 20 quarts. This pressure cooker makes canning a breeze. It’s able to hold 7 one-quart jars, 8 one-pint jars or 24 half-pint jars! 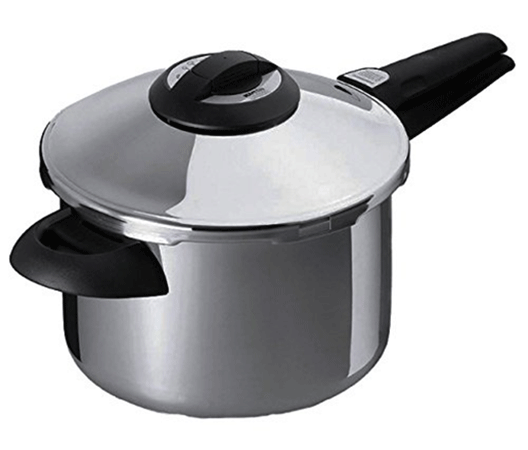 It features an adjustable 3-piece pressure regulator system on a locking stainless steel lid. Quality made for professional kitchen use the body is constructed of hard anodized aluminum and includes a Canning Jar Rack and Steamer Trivet. 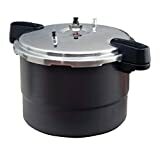 The Granite Ware Pressure Canner is produced in the USA and is endorsed by the USDA for safe canning. Extra large size allows you to make just about anything you want. 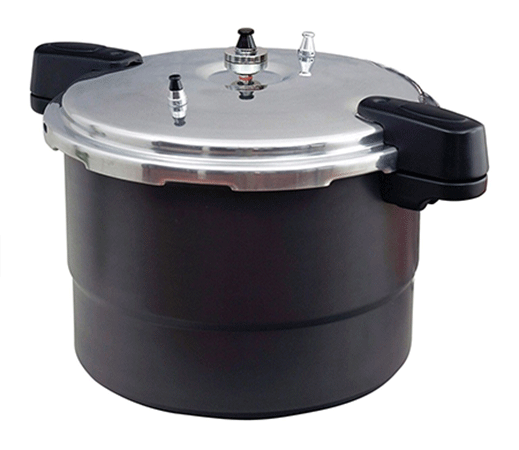 Terrific pressure cooker for canning. 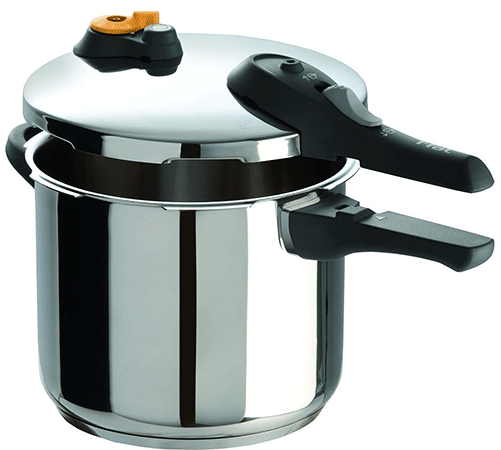 Pressure Canner, Pressure Cooker, and Steamer all in one device. Instruction manual is not thorough for usage. Large size makes storing it a challenge. Main steam valve is prone to rusting. 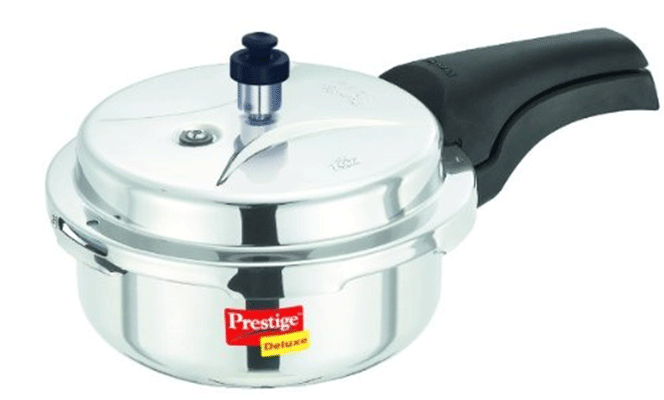 The Prestige Deluxe Stainless Steel Pressure Cooker is made with quality steel and strong lugs. It features a thick base which gives this cooker a safe and long life—it also prevents your food from sticking to the bottom. 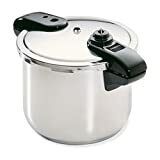 This pressure cooker comes with a 2-in-1 safety device called PI (Pressure Indicator) and is available in a variety of sizes ranging from 2 to 12 liters. Two in one safety pressure indicator. ”Separator Cooking” allows you to cook three dishes at a time. Extra small size good only for two people. Noisy and is prone to vent liquid. Rubber seal wears quickly and leaks. 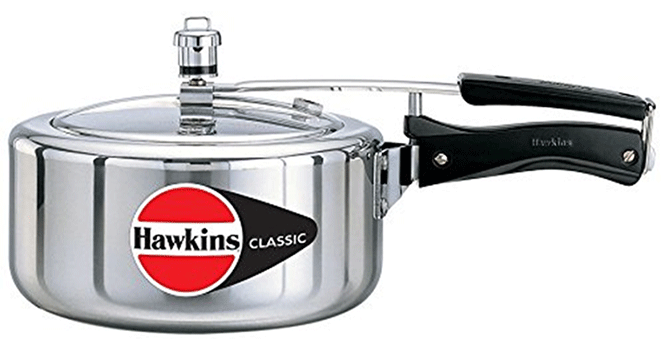 The Hawkins Classic Aluminum Pressure Cooker is a very affordable cooker and features a lightweight aluminum body. The pressure regulator whistles upon pressure release and features a shielded safety valve and a long lasting gasket. Hawkins Cookers Limited offers cookers in 1.5 to 12-liter sizes. High quality, time tested design. Uses an elliptical lid for added seal power. Easy to access parts allows for easy repairs. Small size designed for smaller portions. Gasket on outside of lid makes sealing cooker difficult. Pressure “whistle” is prone to breaking. 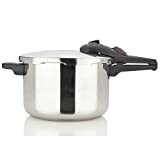 The T-fal Clipso Stainless Steel Pressure Cooker model P45007 features durable stainless-steel construction to ensure long-lasting performance. It has side handles for a secure grip. The capacity for this model is 6.3 quarts and the lid is easy to secure and lock. Like other T-fal cooker models, safety is taken into consideration with a one-hand system for risk-free opening and closing; variable steam-release valve for added control and the lid will not open when contents are under pressure. Dishwasher-safe once the gasket and pressure valve is removed. This model comes with a steam basket and is PTFE PFOA and cadmium free. Side handles for a safe, secure grip. Guaranteed free of PTFE, PFOA, and Cadmium. Comes with steamer basket and recipe book. Takes a while for it to reach proper pressure compared to similar cookers. Need to remember to remove gasket and valve seal when washing in dishwasher. Average size pressure cooker at 6 quarts. 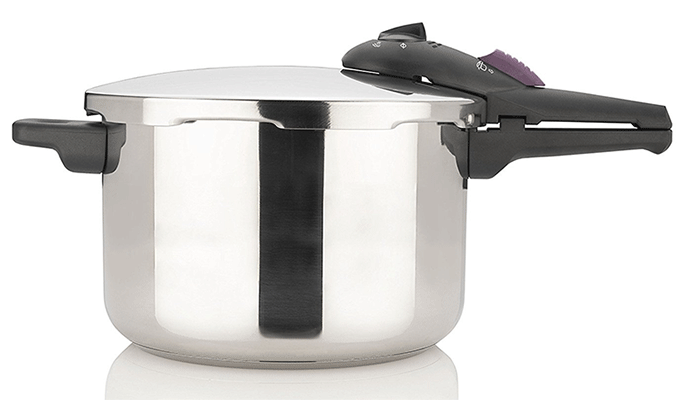 The Fagor Splendid Pressure Cooker is built to be used by even a novice cooker. Simple to use, the Splendid features a single pressure setting of 15 PSI with a spring-type mechanism. It has an easy to use dial that allows you to regulate and release pressure. You can also select the automatic pressure release position for even easier cooking. The visual pressure indicator on the handle informs you when all the pressure has been released so you’ll be cooking your favorite recipes safely and quickly. Triple safety features for extra protection. Fagor is a “Green” company and takes pride in their energy efficient products. 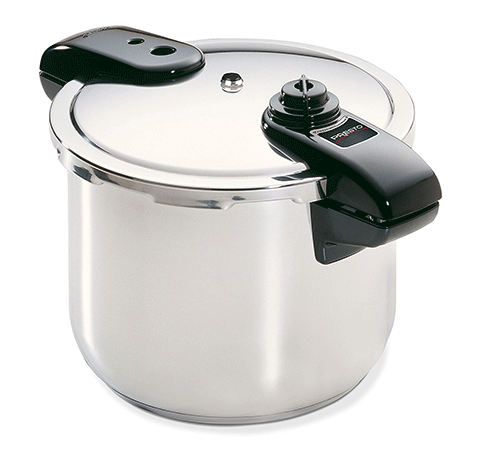 Average size of consumer pressure cookers. Not a good pressure cooker for canning. Redundant safety locks can cause sealing issues. 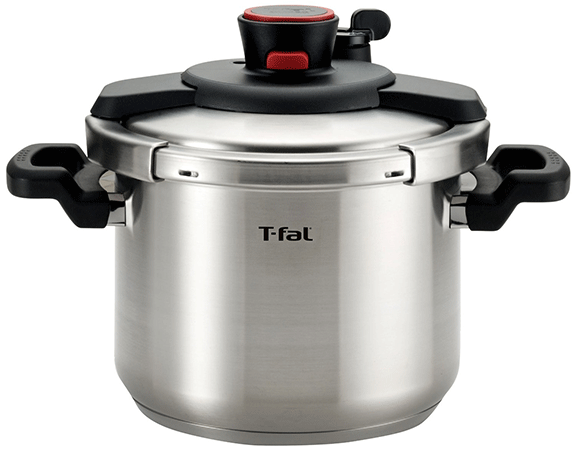 The T-fal Stainless Steel Pressure Cooker model P25107 features a variable control valve allowing you to cook at 10 or 15 PSI. Built like the P25144 model, this cooker also features a quality built stainless steel body with riveted handles for a good grip. It is suitable for a variety of heat sources—induction safe. Though slightly smaller than the other T-fal models, this cooker still has a large enough capacity—holding 6.3 quarts. You can easily cook roasts, soups, stews, and chili to serve a crowd. Similar features as other T-fal models, the lid is easy to secure and lock and also features a steam release valve control for even more precaution. The lid will not be able to open when contents are under pressure. Slightly on the average side at 6 quarts. Screws near handle can shimmy loose causing poor seal. Can burn if seal leaks. The Fagor Duo Pressure Cooker is a nice step up from the Splendid model. It is constructed from 18/10 stainless steel and this will ensure your food does not get burned under the intense heat and pressure. Perfect to use on all heating sources including induction. The handle still features the helpful visual pressure indicator. They safety-lock handle is quick and easy so you can avoid getting scorched by the steam. This model also features the auto pressure release. The Fagor Duo is dishwasher safe and includes a 10-year warranty. Safety locking handle prevents opening while pressurized. Ten year warranty only covers metal components of cooker. Lids can warp and cause sealing issues down the road. The Presto Stainless Steel Pressure Cooker is constructed with a special tri-clad base for even heating and the body is made of stainless steel. This cooker will work on regular and smooth top ranges. The cooker features a pressure release valve with an effortless “quick cool” option. The cover lock indicator displays when the pressure has been released and is then safe to open. The Presto has a heavy-duty locking lid with an inner seal that traps the steam. There is an overpressure plug that will release excess steam. The cooker is dishwasher safe and includes a 12-year warranty. Cover lock indicator won’t open when pressurized keeping you safe. Lid can slide making it complicated to seal properly. When shopping for your stainless steel pressure cooker the first thing you should be on the lookout for is quality heavy-gauge steel. This aspect of your cooker far outweighs its features because a high-quality steel will give you the long lasting life you want—as well as the safety. This information is readily available in most product descriptions or packaging. The latest generation of cookers on the market make the ease of safely preparing pressure cooked meals at home more accessible. Pressure cooking allows you to save time and energy, allowing you to cook deep and flavorful dishes that would normally take hours in just a matter of minutes. Serve restaurant quality food to your family and friends right in your own home.